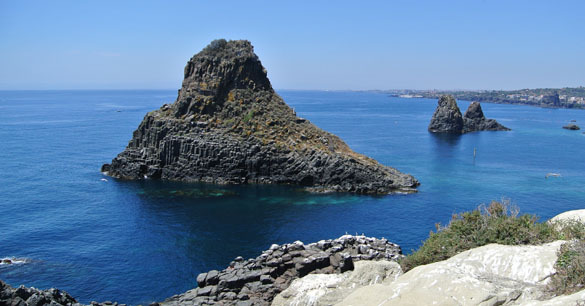 CATANIA, SICILY, ITALY–They may look like impressive sea stacks to you, but it turns out these are three huge stones thrown by the aggrieved and wounded cyclops Polyphemus at Odysseus as he escaped that infernal cave. Who knew? This morning we traveled north of Catania to the Ciclopi Marine Protected Area near Aci Castello and Aci Trezza to look at the evidence of the ancient volcanic activity that led to Mount Etna, and to snorkel and dive on the life-encrusted rocks in the blue, blue waters. We took a boat ride all of about 300 meters across the bay to the tiny island of Lachea, shown above. Notice that there is a crack running through the rocks seen just above the boat. This is an active fault that runs through the middle of the island. Also note that there is a mix of light and dark rocks visible. Lachea is a combination of whitish marls and claystones above with black basalt injected from below. This is the very beginning of volcanic activity in this region as hot magma began to work its way into the overlying sediments of a shallow sea. 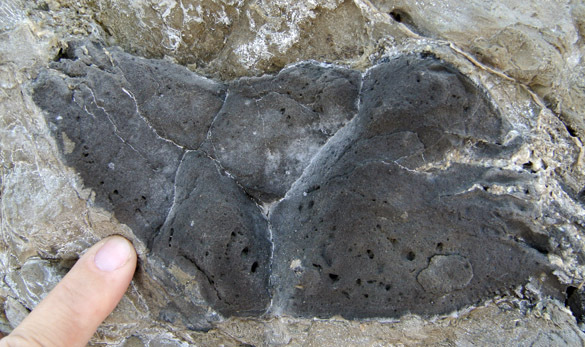 When the lava erupted onto the seafloor, masses of pillow basalts formed (see previous post). The cyclopean rocks in the top image are eroded roots of the massive basalt flows. They show beautiful columnar jointing. 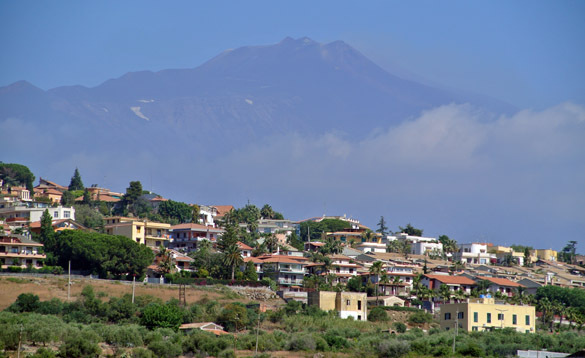 From Lachea we can see the glowering outline of Mount Etna, the true giant in our story. 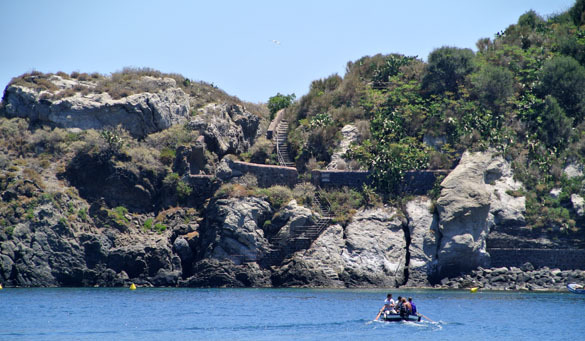 The island of Lachea and its surrounding rocks has been the site of a research station for over a century. The fauna and flora of both the island and the seafloor down to 110 meters are protected by law. This pretty green lizard is common on Lachea and apparently endemic (found only there). It is Podarcis sicula ciclopica. Its mating season of three months is about to begin, so there was much lizardly activity. 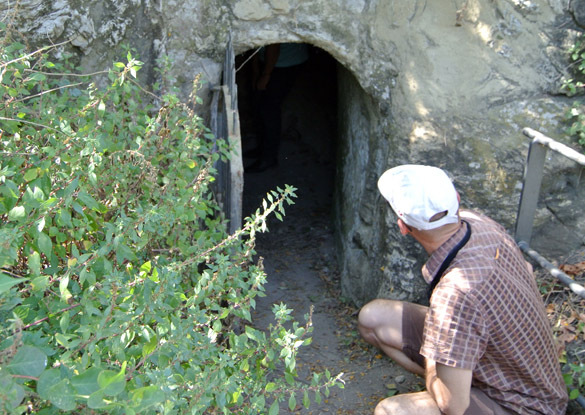 One of the first places we visited on the island was this tiny historical grotto. Only five of us could crawl into this completely dark chamber at a time. Once inside you can carefully stand up and (at least some of us) touch your head on the ceiling. That turned out to be a mistake because the guiding biologists then show you the unique cave spiders hanging on their webs about your ears! 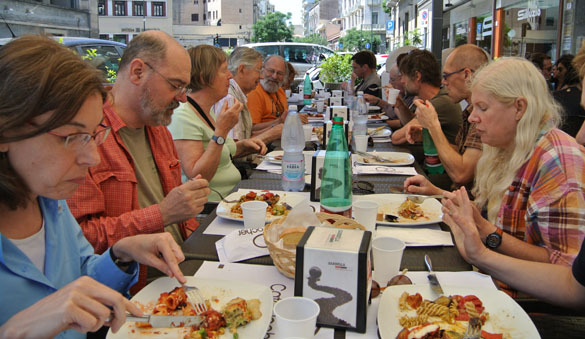 Finally I must show you at least one of our large Sicilians lunches, this one back in Catania after our morning marine excursion. We are eating well, if a bit later than usual — and with much more time in the process!